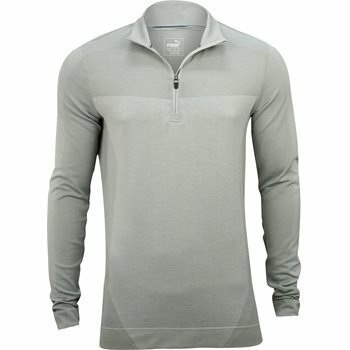 The Puma EvoKnit Seamless ¼ Zip pullover features EvoKnit and Dry Cell technology. EvoKnit technology offers seamless construction with engineered stretch panels for ultimate fit and unrivaled comfort while Dry Cell technology offers moisture wicking that draws sweat away from the skin to keep it cool and dry for all day comfort. The EvoKnit Seamless pullover is made with nylon and polyester blended fabric and displays the Puma logo at the left sleeve.